Since March 2016, El Salvador has had in place a series of "exceptional measures" to combat gang violence in the country. These steps include measures in the prisons such as harsh solitary confinement for gang chiefs, elimination of visits to inmates, blocking of cell phone signals around prisons, as well as longer pretrial detention, more use of the military, and greater freedom of security forces to use deadly force in pursuit of suspected gang members. Some of these measures are authorized explicitly by the exceptional measures decree, and others are simply an ever harsher approach to crime fighting. Remittances from abroad grew 10.1% in the first 11 months of 2017 according to El Salvador's Central Reserve Bank. The funds which Salvadorans living abroad send back to family members in the country totaled more than $4.5 billion and represent a significant component of the overall economy in El Salvador. More than 97% of the remittances are sent from the US. The Central Reserve Bank attributes the solid growth in remittances to the strong US economy with low levels of unemployment. For the first time in 2017 we began to see blows in a Salvadoran court against the impunity which has so far protected those who ordered one of the largest massacres of children and other civilians in the western hemisphere. The massacre of the hundreds of children and others at El Mozote took place in December 1981, and 36 years later, the witnesses and the relatives of the victims are testifying in open court. We are still a long way from justice. The armed forces still have not opened their archives, and there are fears that the military has long since expunged any record of the command and planning of this scorched earth military operation. But the momentum is building none the less, and the trial will continue in 2018. The Salvadoran human rights organization Cristosal has a very good overview of the 2017 developments of the El Mozote child massacre case here. Two new reports available in English provide extensive looks at the challenges facing El Salvador at the end of 2017. The International Crisis Group released its report titled El Salvador’s Politics of Perpetual Violence. The paper looks at the domestic security problems in El Salvador and the government's ineffective policies at dealing with the violence. The Center for Latin American & Latino Studies at American University issued a working paper titled Extending Temporary Status for El Salvador: Country Conditions and U.S. Legal Requirements. The paper is provided in the context of the US government decision on TPS for El Salvador which needs to be made at the beginning of January 2018. One common theme in both papers -- a call for the US to extend TPS for Salvadorans in order to avoid the possibility of exacerbating an already challenging environment for the country. Recent polling by La Prensa Grafica reveals a growing disaffection with the country's two major political parties and a majority of Salvadorans whose political preferences fall between the left and the right. When asked about their political ideology and whether they identified with the right or left, almost 58% of those polled said "neither", the center, or refused to answer. Thirty-six years ago, from December 10-12, 1981, the armed forces of El Salvador massacred hundreds of children in the town of El Mozote and surrounding communities. Last week El Salvador's government divulged the results of the first official register of the victims who died in that massacre. Of 978 victims executed, 553 or 57% were under 18 years of age and 477 were 12 and under. Twelve infants died in their mothers wombs. Henceforth, at El Salvador Perspectives, we will refer to this atrocity as the "Massacre of Children and Others at El Mozote." At the end of November, the online periodical El Faro published on its website a wide-ranging investigation titled X-Ray of an Educational System in Ruins. With data, video, interviews and analysis, El Faro presents a comprehensive look at an educational system which is largely failing to provide the education needed by the country's children. Although annual spending to provide school uniforms, shoes, school supplies and a meager daily meal have helped boost attendance levels in the schools since 2009, the government has made little progress in actually investing in what is taught in those schools. Yearly testing by the government of high school students shows the lack of academic progress year over year. 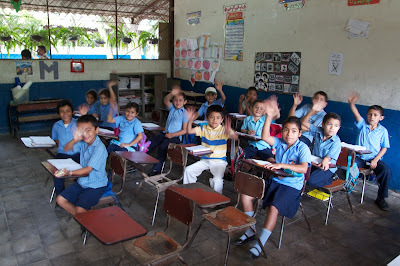 84% of school students in the country attend one of the 5136 public schools in El Salvador. Here are some of the news stories coming out of El Salvador this week. Edgar López Bertran died this week. Popularly known as "Brother Toby," he was the founder of one of El Salvador's largest evangelical mega-churches, the Baptist Biblical Tabernacle Friends of Israel. The reins of the church now fall to his son, Toby, Jr.
Testimony resumed in El Mozote massacre trial. Additional witnesses are taking the stand in the trial of El Salvador's military command for its role in the 1981 massacre in El Mozote and surrounding communities. Former Salvadoran Colonel Inocente Orlando Montano was finally extradited by the US to Spain, where he has already been brought in front of a judge in connection with his role in the 1989 Jesuit murders case. With one of the defendants finally physically present in Spain, the case can now proceed.